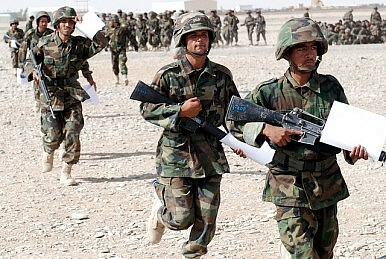 Is the Afghan Army Prepared for 2015? Plus, India and Pakistan trade fire, North and South Korea trade fire, and the future of U.S-India relations. In a troubling development, the Afghan army’s death rate spiked by 30 percent, suggesting that the country’s military remains ill-equipped for the host of security threats the country faces. Additionally, as U.S. and NATO troops prepare to withdraw, this rate could further spike. The Associated Press report on the death rate spike also notes that “A bigger worry than the increased deaths, though, is the havoc the military could unleash on the country if the army rips at its ethnic seams.” Afghanistan and the United States recently concluded a Bilateral Security Agreement that will allow a residual U.S. force to stay on beyond the end of this year for limited counter-terrorism operations and training purposes. In recent days, India and Pakistan have been trading fire over the Line of Control (LoC), the mutually agreed line demarcating Pakistan-administered Kashmir from Indian-administered Kashmir. So far, five Indian and four Pakistani civilians have been killed by mortar fire along the LoC. Meanwhile, North and South Korea traded warning shots after a North Korean ship briefly crossed the Northern Limit Line (NLL), the boundary demarcating the maritime extension of the border between the two countries. Although North Korean vessels regularly cross the NLL, it is notable that this skirmish occurred just days after a high-level delegation from North Korea visited the South. That exchange, as The Diplomat reported, represents the highest-level bilateral between the two Koreas in at least five years. Over at War on the Rocks, Joshua White reflects on what to make of Indian Prime Minister Narendra Modi’s recent trip to the United States when it comes to defense and security cooperation between India and the United States. Most helpfully, White contextualizes the progress made during Modi’s trip and his joint statement with Obama in the context of the broader trajectory of U.S.-India defense ties over the past decade. He notes that “Ultimately, Prime Minister Modi’s visit was not about specific deliverables. For the prime minister, it was about demonstrating that he would not let the past get in the way of a strong future for U.S.-India relations, and that India would not take a zero-sum view of its global relationships and obligations.” If you missed it, I broke down Modi’s joint statement with Obama for The Diplomat here. Between India and Pakistan, Can 'Negative Peace' Serve as a Strategic Good?Pulwama, Balakot—What Next? Escalation Risks and the India-Pakistan CrisisIndian Air Force Strikes Pakistan-Based Terror Camp in ‘Preemptive Action’New Terror Attack Exposes India’s Limited OptionsWho’s Driving the Wedge Into US-South Korea Relations?